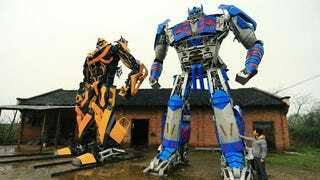 Yu Zhilin and his son's work is solid proof that the Transformers movies are the most popular thing in China, and in this case, I think it's absolutely forgivable that they used the Michael Bay versions for their statues. Scrap metal and discarded car parts have never looked so good. According to ShanghaiIst (via Sina) they only used those materials and an abandoned factory for their work, and while the first model took them three years to complete, they're now really good at building these things. I'd like them to make a Metal Gear REX or something similar with the same technique. That'd look incredible.